Keith Cooper is available to speak at (worldwide) conferences, company presentations and training events, and also presents lectures to photographic organisations and societies (professional and amateur). His talks, seminars and demonstrations range from technical aspects of digital photography, fine art printmaking and colour management, through to the interpretation of landscape and the business side of being a professional photographer. Recent conference topics have covered Architectural Photography and Digital Black and White Photography, and all talks can be customised to match the experience level of the audience. Particularly popular are his demonstrations of fine art printmaking and colour management, where he illustrates some the benefits of monitor and printer profiling with examples from recent reviews and articles on this site. If you’d like to discuss a possible event, please do feel free to call or email us. 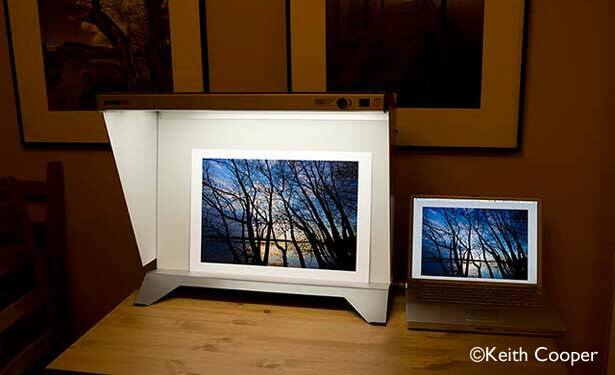 The photo to the right shows a demonstration of soft proofing, using a PDV3 viewing stand. This is covered in Keith’s colour management lecture. OK, there is a bit more to it than that, but Keith is often asked to give short presentations to local business organisations and social groups. There is a short article about better scenic photos in Keith’s blog. At whatever depth and complexity is needed, from the details of semiconductor technology to camera design, Keith can customise presentations to meet your business needs. More info: Digital Imaging Technology. Costs vary considerably depending on location and the nature of the event. For our corporate training, our rates are outlined on the main Photography teaching/training page. Rates for lectures and seminars depend on the nature of the event, but are typically significantly below our half day training rates and usually do not attract a ‘per delegate’ charge. We’re based in Leicester, in the UK, so expenses will vary with distance, particularly if overseas or an overnight stay is required. For local camera clubs and societies, Keith offers a limited number of ‘expenses only’ talks each year. Keith also provides bespoke personal photography tuition to private individuals in the Leicester area (UK). This is in addition to Northlight’s corporate training services, and is aimed at at photographers looking to learn more about particular aspects of photography, such as architecture and landscape. Also popular with other organisations where staff need to take photos for everyday business use. 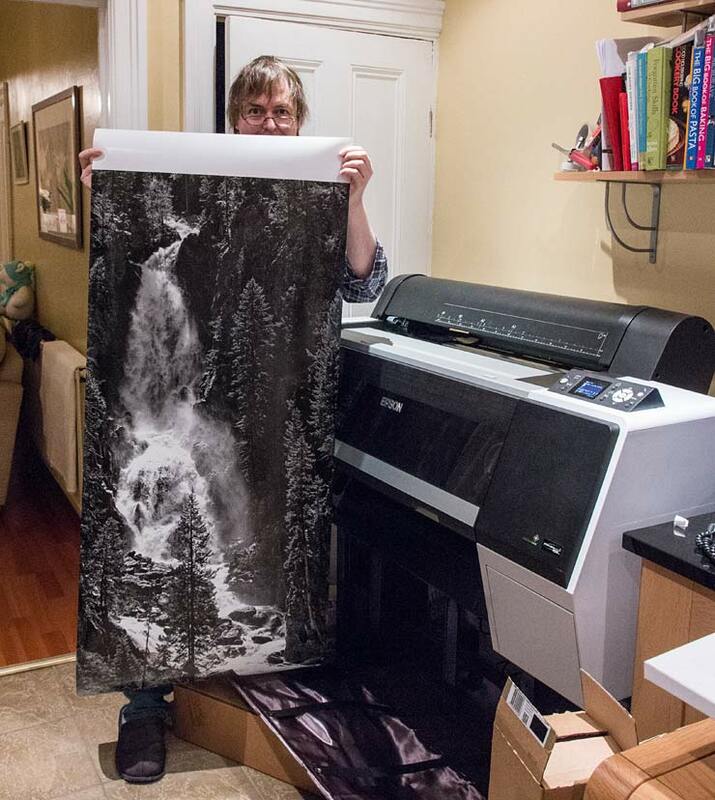 Keith Cooper demonstrating aspects of fine art printing with a large black and white print.